Dec 17, 2018 at 06:02 PM | 70 Views | Last edit Dec 17, 2018 at 06:16 PM 5 rev. 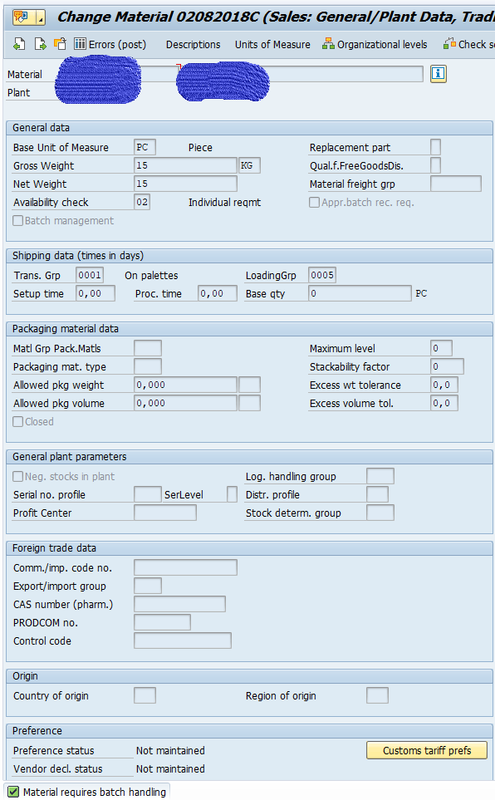 i need help to enable screen fields of a specific view(Sales:General/Plant Data) in MM01/02 after Error Message(if xchpf is not set when its set in other plant) in CustomerExit. It looks like this after i try to save Material. Every combination of Message Type and Display Like didnt work. Also RAISING APPLICATION_ERROR didnt work. I also tried to loop at screen and set screen-input = 1. And Chain-Endchain cant be used in UserExit. It feels like its a super easy problem but i cant figure it out since days/ even weeks. I would appreciate your help very much. IF ( sy-tcode = 'MM01' OR sy-tcode = 'MM02' ) AND ( sy-ucomm = 'BU' OR sy-ucomm = 'YES'). IF wmarc-werks = '0001' AND wmarc-xchpf IS INITIAL. SELECT SINGLE * FROM marc INTO wa_marc WHERE matnr = wmarc-matnr AND werks = other_werk. CONCATENATE 'Material' wmarc-matnr 'ist im Werk' other_werk 'chargenpflichtig. Bitte in Werk' wmarc-werks 'auch setzen.' INTO xchpfcheck_text SEPARATED BY space. * MESSAGE ID 'L2' TYPE 'E' NUMBER '024' RAISING application_error. ELSEIF wmarc-werks = '0002' AND wmarc-xchpf IS INITIAL. I found out that this coding works on other SAP system-server. When i call 'MESSAGE e024(l2)' on our productive server it works as intended. But in our test system it disables all fields.